Found at one of the largest sandbars in the world, Stingray City Sandbar enjoys waist-deep crystal clear Caribbean waters, and is definitely the best tour you can do on island. Water depth varies between 1 & 5 feet, depending on weather and season. Clear water provides easy visibility of the stingrays, even without a mask. Watch in amazement as these ethereal sea creatures glide over soft sand to greet you, and wait patiently to be held, hand fed and kissed for 7 years good luck! Each visitor leaves Stingray City with wonderful life long memories and a greater appreciation for these beautiful beings. Captain Mario's favourites? Barbara, Trinton and Snowflake. After a long day fishing, the Cayman fisherman used to return to the calm waters of the North Sound behind the Reef. Here, they could safely gut and clean their fish, tossing the offal out into the shallow water - no harm done to anyone and the fish would love it! This became a regular feast for the stingrays! This tradition was continued for years and eventually local divers found that the stingrays were willing to allow the divers into the water, and were more than happy to be hand fed. In 1987, Skin Diver Magazine found out about it - they printed a story on this phenomenon, and Stingray City was born. It has now become one of the major tourist excursions in Grand Cayman. 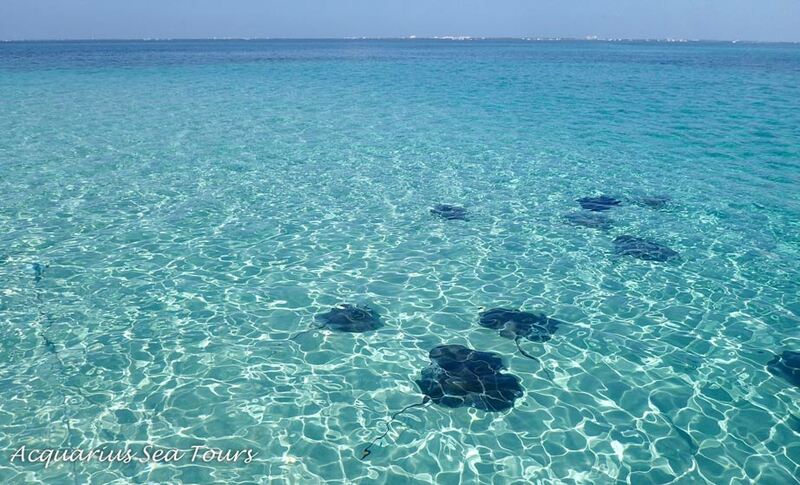 Many of the stingrays from the Sandbar are to be found here as well, and they swim alongside the deeper scuba divers and shallower snorkelers alike. Many travellers who have already enjoyed the Sandbar like to visit this site.